Let "The Sprinkler Doctor" diagnose your sprinkler system's ailments! Nothing can be more frustrating than a sprinkler system that is not operating at its maximum potential. That is why Atchison Sprinkler & Irrigation Systems offers immediate same day response on most sprinkler system repairs. Whether you need help with a broken water pipe or a sprinkler head replacement at Atchison Sprinkler & Irrigation Systems, we are here to take the stress out of caring for your yard. 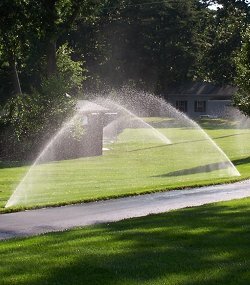 Specializing in residential sprinkler repair, our expertise in sprinkler valve replacement, sprinkler wiring, and sprinkler timer repair or replacement helps to create a properly operating and well-designed sprinkler system that supplies water uniformly over your entire lawn without wasted runoff. We can respond to most of your sprinkler system repair needs quickly because we understand how important your service needs are. Atchison Sprinkler & Irrigation Systems will assess your sprinkler system repair issues and find solutions that will promptly restore watering needs to your lawn. Upon consultation, we take all aspects of your sprinkler system into account in order to insure reliable future operation. Below you will find a summary of our sprinkler repair services. Call Randy at Atchison Sprinkler & Irrigation Systems at (530)246-1690.